In 30 years of my life, I’ve never come to any music concerts or even fan meetings. 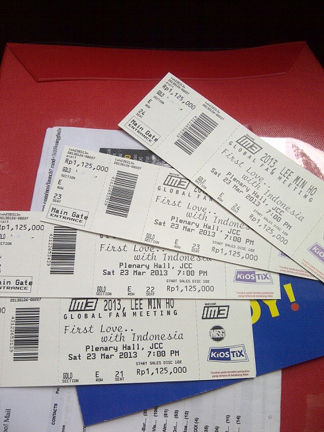 But I break the record by coming to Lee Min Ho Global Fan Meeting, First Love with Indonesia on March 23rd, 2013. Can't you tell how excited I was? I arrived at 4 PM, 3 hours earlier than the event schedule. 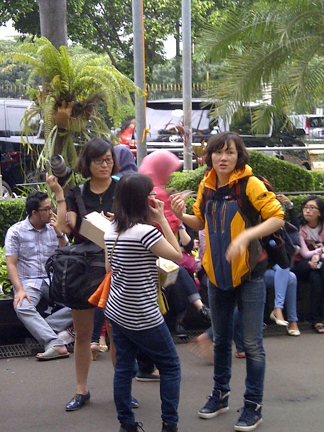 I had to wait for Sonya and Linda before entering the venue since I have their tickets. The crowd outside was really crowded. 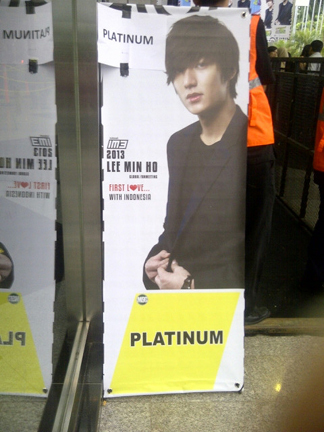 I saw so many Minoz holding DIY banners, posters, and also Minoz attributes. 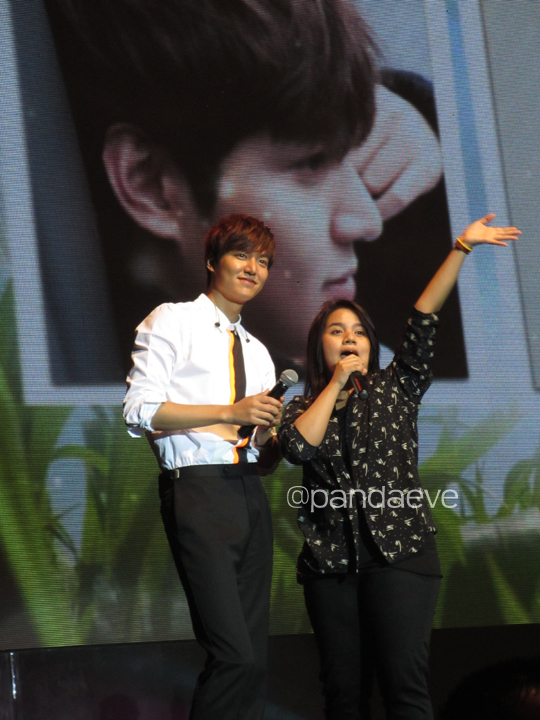 Quite a surprise since the FM ticket price is a little bit pricey, but Minoz Indonesia really shows their great interest for coming and seeing their idol live on stage. 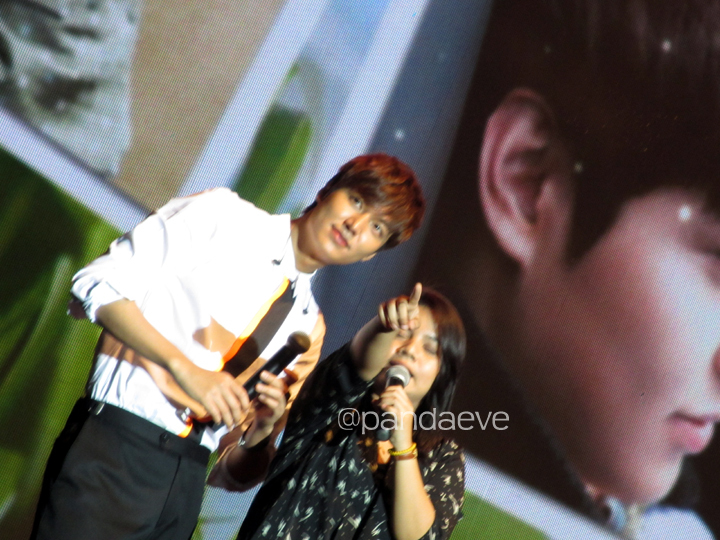 I also spotted some International Minoz among the crowd. The Hall gate was opened around 6 PM, and the show was scheduled to start at 7 PM. But as I predicted, it was delayed. 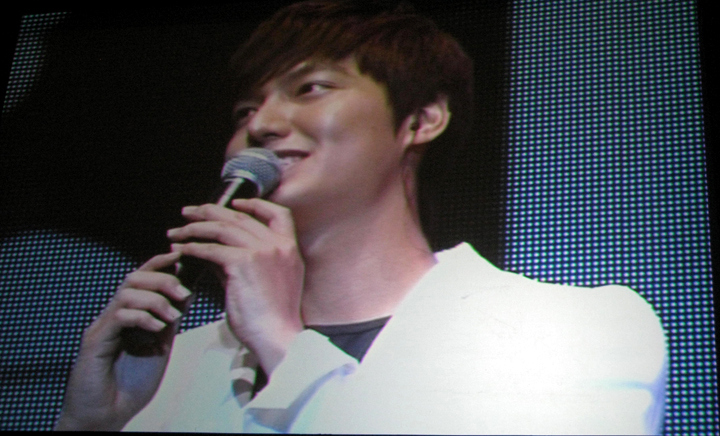 The audience was started to show their impatience and shouted “Lee Min Ho! 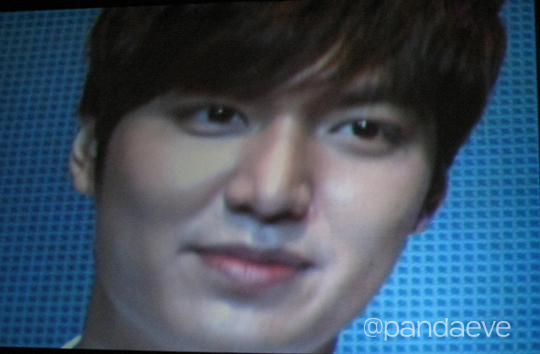 Lee Min Ho! 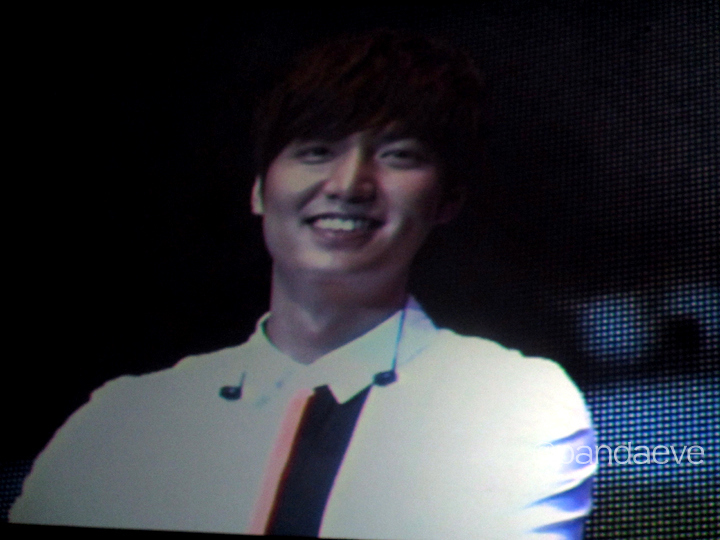 Lee Min Ho!”. Then finally after delayed for an hour, the MC came out. 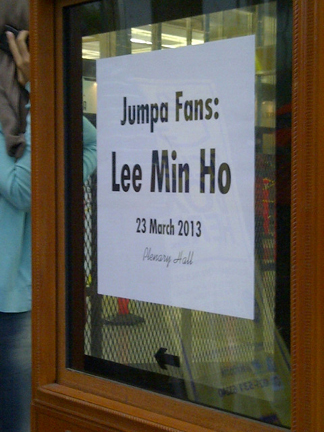 But still we had to wait for another 10 mins since he had to make an announcement of 15 lucky audiences who got a chance to take a picture together with LMH and get his autograph. Sadly, I wasn’t among those 15 people. 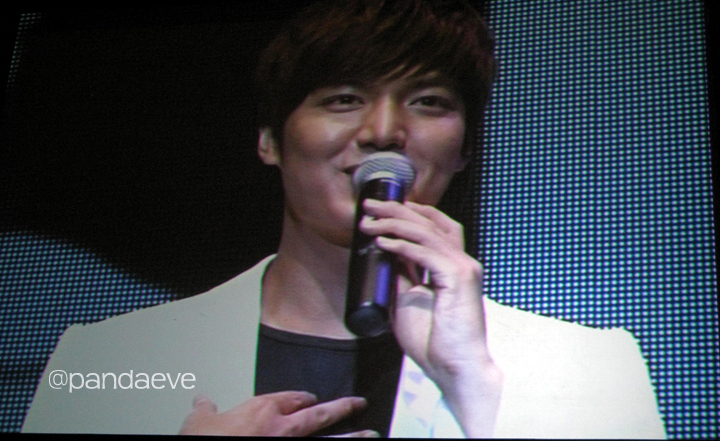 There was an opening clip, before finally Lee Min Ho came out on stage and singing one of his songs “It’s Love”. The crowd was cheering out loud, and I was like freezing for a moment seeing this guy live on stage. He has a skinny and tall figure, just like a model has and his smile is really charming that I can’t take my eyes off him. I was trying to record his first performance singing “it’s Love” but haish..my hands were shaking over excitement! And the people in front of me were suddenly stood up and blocking my view *sobbing* I can’t blame them; they must be as excited as I was. He was wearing a simple white shirt (with orange and black stripe in front) and black trousers. Pretty simple outfit but his charisma shines. I held Sonya who were seating next to me and I shouted: "He is here! So handsome, omo!!" 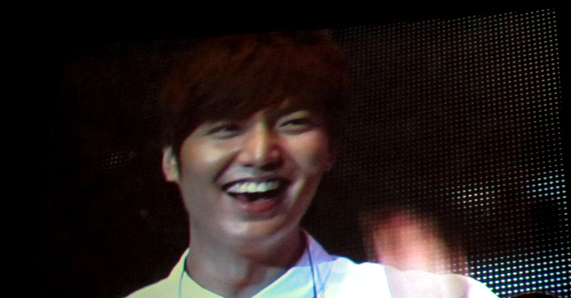 The fan meeting was filled with games and Lee Min Ho was eagerly participating in each game. He made the “QnA” session so much fun though there were some “too serious”, like question about his home address and mobile number; he was laughing and told us that actually he thinks his fans out there already figured out where he lives. There was a fan who took a picture in front of LMH’s van and when the fan sent the picture to LMH, he was in shocked and surprised (how could this fan take a picture in front of my car when it’s parked in my apartment parking lot?). It was a Thai fan btw, how surprise was that?! He was laughing when telling this story and he continued: well OK, hmm I’m using a blackberry but I’m not using Whatsapp. So I’m just going to tell you my phone number. And he did, but he left the last 3 numbers as a secret. Kekekekek I believe almost 90% of the audiences took notes of those numbers (I was trying to hahahha XD) and some of them maybe really trying to find out what are the last 3 numbers (Linda, I know you tried haha!). 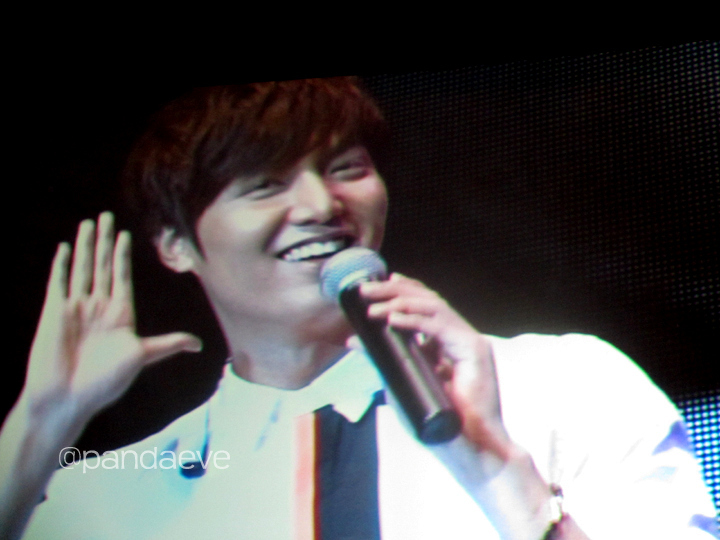 He giggled at audiences who kept shouting “OPPA! OPPA! OPPAA!” and when one of the audience who came on stage called him “OPPA” he smiled and replied “Yes, Dongsaeng” hahaha he is so cute and friendly and his dorky laugh is adorable! :) He also cutely played Gai Bai Bo (or SUIT in Bahasa) and Cham Cham Cham and show his eagerness in learning Indonesian culture by learning hand games, Saman dance and also angklung music. I can tell you, this man is smart! He is good in memorizing moves/steps, like in Saman dance, in a relatively short time. 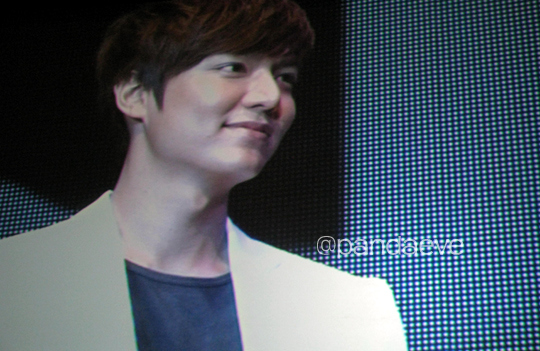 Other than games and QnA session, He sang another 2 songs : “In The Rain” and my favorite - “My Everything”. 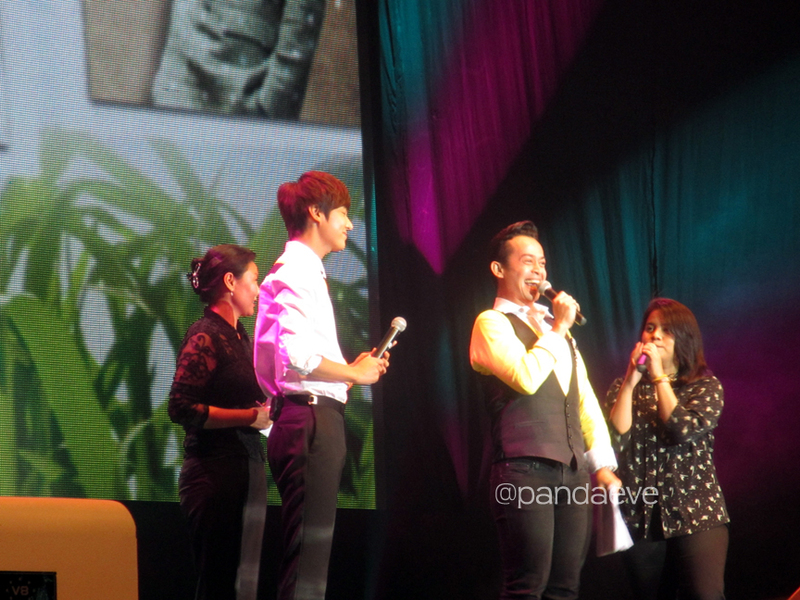 At the end of the show, he read a love letter for his Indonesian fans. One of the lines that really touch my heart is when he said that he wants to be a sincere and humble actor. For a star like him, I’m touch by his sincerity and humbleness. Oh dear, I pray that you will be blessed with so much good thing and fortune, and you may become a great actor with a humble heart. 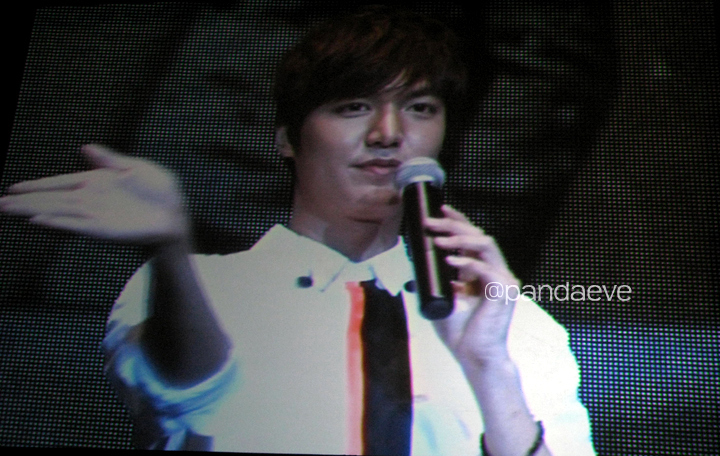 LMH is playing "Cham Cham Cham"
The 2 hours show was ended too soon. I believe everybody who was there was feeling the same. 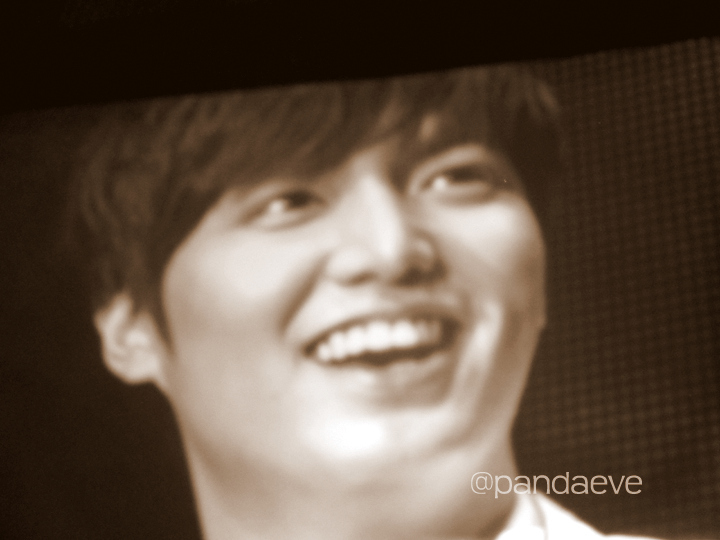 The show is over but the memories of seeing Lee Min Ho in person warmth my heart. I confirmed that he has a skinny and tall posture, a handsome face and a very nice smile also a dorky laugh which makes him more adorable. But I also noticed that he is very observant and charming. When he was being asked about his fave type of woman, he mentioned that he likes woman who wears hijab. He is aware that Indonesia is a country with Moslem majority and and lots of his Indonesian Minoz are wearing hijab, so as a courtesy he did mention that he likes woman who wears hijab and lots of Indonesian Minoz was cheering in so much joy to hear that :) so nice of you, MinHo ssi. And when LMH had to picked lucky audiences by throwing some tennis ball towards the audiences, he kept saying this to audiences who excitedly try to catch the ball: “please be careful and don’t get hurt.” This little gesture shows how nice he is as a person. Overall, I am grateful to have a chance to see him in person. Thanks to my hubby, who convinced me to go so I won’t regret it later. And he is right! I believe I will regret it someday if I didn’t come to the FM that day. Though I didn’t get the chance to go up on stage, I have beautiful memories of seeing him live on stage.